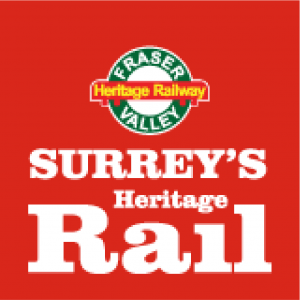 Visit us at the Cloverdale Station, at the foot of 176A St, just south of HWY 10 (56 Ave) in Surrey. We are across the street from the original Surrey City Hall, now the Surrey Archives, which is next to the Surrey Museum. HWY 10 (56 Ave) and 176A St.
just behind the Clydesdale Inn. * As with any railway, motive power, schedules and fares are subject to change without notice. Adverse weather conditions or technical/safety problems may prevent operations. There are four basic approaches to our campus, and they involve only two highways: Highway 10 (east and west) and Highway 15 (also known as 176 St) north and south. Highway 1: Exit 53 turn left (south) onto Hwy 15 to Hwy 10, 9 km (5.5 miles), turn left (east on Hwy 10 travel 2 blocks and turn right on 176A St, the SHR Cloverdale Station is immediately in front of you. Parking to the left of the station. Take Hwy 99 to Hwy 10 (Ladner Trunk Road) to Hwy 15 intersection, then straight across (east) two blocks. 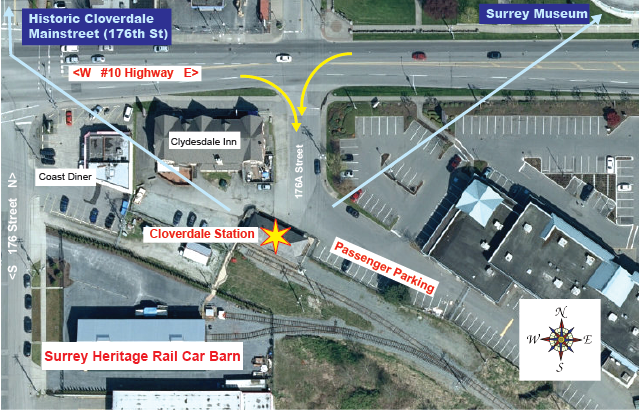 Turn right on 176A St, the SHR Cloverdale Station is immediately in front of you. Parking to the left of the station. Take Hwy 10 to 176A St (2 blocks east of Hwy 15) turn left on 176A St, the SHR Cloverdale Station is immediately in front of you. Parking to the left of the station. (U.S.) Cross at the Blaine/Pacific Crossing via Route 543 from I-5, also known as the truck crossing. You will enter Canada on Highway 15 (at Zero Avenue). Drive north 11.4 km (7 miles) to the intersection with Highway 10 (56th Ave). Turn right and drive two blocks. Turn right on 176A St, the SHR Cloverdale Station is immediately in front of you. Parking to the left of the station. (U.S.) If you enter from the Peace Arch Crossing, take the first exit to 8th Avenue (immediately at the right) and turn right (east). Drive 1/4 mile to intersect Hwy 15, and turn left (north) then proceed as above.